If you see a tree down along the canal or trail please call the Feeder Canal Alliance office at 518-792-5363 to let us know. We will pass the message along to have it taken care of. 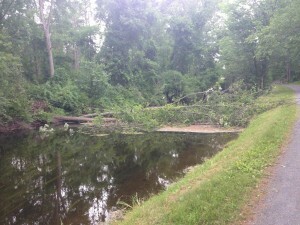 There are currently several trees down along the canal, like the one pictured below between the Feeder Dam and Haviland Cove in Glens Falls.